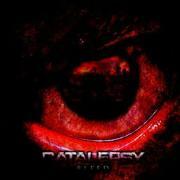 Florida deathcore/metal merchants CATALEPSY have been around since 2004, and created quite a reputation for themselves. HATEBREED`S Jamey Jasta signed the band to his own label Stillborn Records for their 2007 debut “The Godless”, which was followed by a full-length, “Iniquity” in 2008. This time around a more mature album is promised, without losing an inch of their previous heaviness. Is that true? There are a lot of muffled hard/screaming/blackish vocals and some true dissonant chords on offer here. When CATALEPSY attracts my interest they use loops, melody and memorable guitar patterns. Those moments of greatness occur in “Goliath”, “Monolith” and the final track “Vexation”. In between that there I find an odd overall sound, a pulsating blur that reminds me of a concert hall over here, a former work shop that is not suited for music. Discord might be fun, in small doses – not in a full album. The vocals are varied, but more often than not in an annoying way. They are clearly influenced by death metal, stoner and sludge, and by putting their own interpretation out, they ruin the effect. I´m not saying this is absolutely hopeless, but it is a annoying and hard to listen to. Or maybe I´m an old fart?